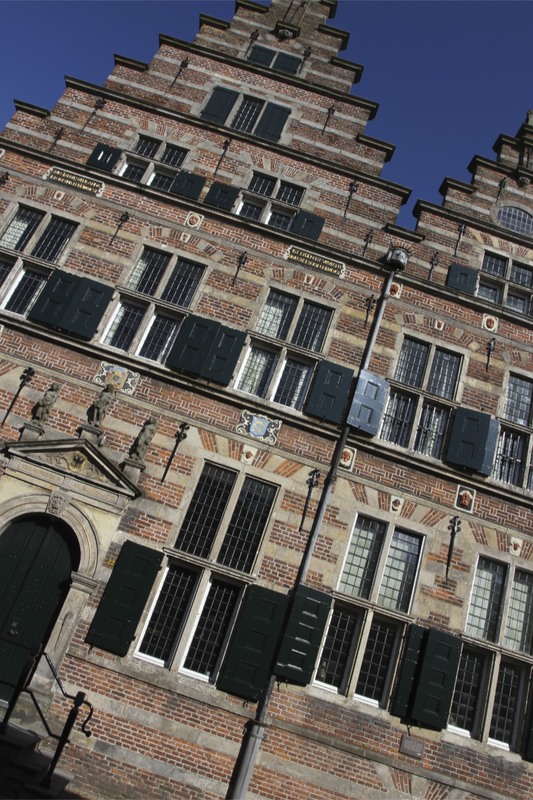 What to say about Naarden? This small, attractive village would be worth a visit on the basis of its peaceful cobbled streets, historic buildings and good cafe-restaurants alone. The fact that it sits inside an almost perfectly preserved 17th Century Star Fort surrounded by water and lovely countryside, makes it a stellar destination. Arriving on a sunny Sunday morning I didn’t know what to expect, but my first sight of Naarden in the warm morning air made me glad I’d dragged myself out of bed. 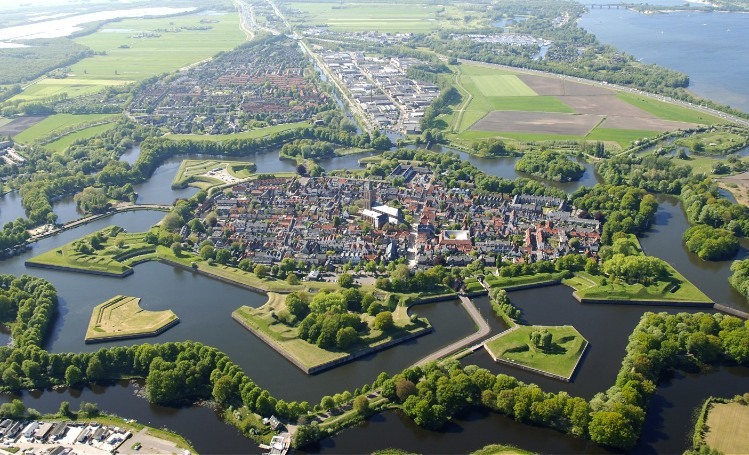 To truly appreciate Naarden’s physical features you have to see it from the air, from where its true nature reveals itself. It’s a Star Fort within a Star Fort, two concentric rings of water adding extra defensive features to the imposing walls of the fortifications. I’ve seen Star Forts in lots of places, but nothing to compare to Naarden. I crossed a bridge onto the first set of fortifications, the outer star; covered in trees it has a path that takes you on a 3.5km circuit around the town. It’s a lovely walk with views towards the town, and early on a Sunday morning quiet and peaceful; an occasional cyclist, a few joggers and dog walkers were my only company. Finding my way to a causeway I approached the town’s main gate, passing under the arch felt a little like stepping through a doorway into the past. Moments later I was walking on top of the inner star defences, which provide wonderful views outwards over the surrounding water and inwards over the town’s rooftops. I walked with a genuine sense of wonderment at the history that had forged this incredible place. 21st Century Naarden should rightly be known as New Naarden; back in the 9th Century the original Naarden, located north of the present-day town, suffered several natural disasters, culminating in destructive storms in the early 13th Century that created the Zuiderzee and drowning most of the land in this area. The town clung to life but by 1350 had been abandoned to the water. This was a strategic area though and the town was rebuilt on its current, slightly elevated, site. When Spain ruled the Lowlands the town was prosperous and heavily fortified. In some towns that might be a good thing, unfortunately Naarden doesn’t have a happy history. During the Eighty Years’ War for Dutch independence the town held a vital strategic position but loyalties were divided. When a Spanish army arrived in 1572 it was allowed inside the fortifications. An unwise decision. As part of their hearts and minds campaign, the Spanish decided to massacre Naarden’s inhabitants and burn the town to the ground. The Naarden Massacre was a pivotal moment in the war. The Dutch realised the Spanish weren’t interested in compromise and the rebellion grew into a war for independence. This finally came in 1648 but didn’t bring Naarden peace for long. When Louis XIV, France’s Sun King, decided he wanted The Netherlands as a souvenir his armies captured Naarden and nearby Utrecht in 1672 as a prelude to an assault on Amsterdam. The town was back in Dutch hands by 1673, the French sent packing with their tail between their legs after the Dutch breached the dykes and flooded the land. As the key to Amsterdam’s security, this scare finally convinced the authorities to get serious about Naarden’s defences. Most of what you see today dates from a busy construction period after 1673. Ironically, the architect was French. During the Napoleonic Wars, Napoleon himself dropped by for a spot of lunch one day – after which things calmed down a bit. The defences came in handy as shelters during the First World War, by which time modern weapons had made them obsolete. That must have come as a relief to the townsfolk, the defences seem only to have attracted trouble. Walking on the inner defences you can appreciate just how massive they are; eventually I arrived at a part of the inner defences housing the Vesting Museum. With restored historic guns dotted around the fortifications and an exhibition inside the defences, it tells the town’s story and gives a real sense of what it must have been like under siege. Constrained by its extraordinary, and massive, city defences – some of the best preserved in modern-day Europe – Naarden is a compact place that doesn’t take long to wander around before you realise you’re retracing your steps. The town has a prosperous air and on a warm spring day sitting in one of the cafes in the town centre is a pleasant way to catch your breath after inspecting the defences and narrow streets.